This is oldest written exercise program for preventive medicine practiced today; being a sequence of natural movements and postures based on the movement of animals. 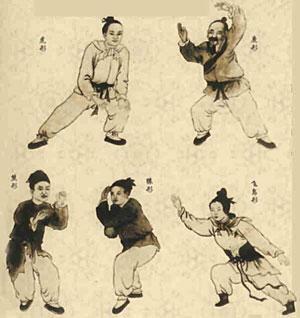 They were developed by a Chinese physician called Hua Tuo around 200AD, and have been around so long because they are a fun and effective method of helping people of all ages and abilities to develop strong, healthy bodies. The five animals are the fierce and untamed tiger, the graceful deer, the steady and lumbering bear, the agile monkey and the flying crane. Each animal has sets of exercises that strengthen the muscles and tendons, balance the brain, improve coordination and rejuvenate the internal organs. All of the Five Animal Frolics make you more integrated in your body, more solid on the ground, more sure in your walking, more cultivated in your movements, more confident, flexible and strong. Strengthen your muscles and tendons. Help prevent diseases of the nervous, cardiovascular, respiratory, locomotive and digestive systems including chronic gastritis, peptic ulcers, high blood pressure, constipation, chronic bronchitis, arthritis and benign hypertrophic prostate. the requirement of the soul."